Provide opportunities to experience state-of-the-art-technology that will immediately enhance your skills. Technology is on the move! Active learning and retraining is essential. The Newport Coast Oral Facial Institute is a state-of-the-art working laboratory designed by clinicians for clinicians. Fully equipped for technique sensitive training, a setting for intensive learning in a stress free environment has been achieved. Each work station is equipped with an especially designed clinical microscope, manikin heads for simulated patient care, and personal video monitors to observe live demonstrations. Additionally, there are ergonomically designed operator chairs, three modular demonstration stations in the teaching lab, and three teaching operatories for live patient demonstrations as seen through the clinical microscope. Students have multidisciplinary, hands-on mentoring experiences with some of the top international teacher/clinicians in the world. Classes have received rave reviews from all the participants enrolled in these innovative courses. 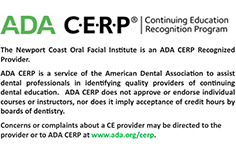 The Newport Coast Oral Facial Institute is an ADA CERP Recognized Provider.